Five years ago, Space Shuttle Discovery launched on her final mission. Today we take a look back at her history and accomplishments during 27 years of spaceflight. Space Shuttle Discovery arrived at Kennedy Space Center in Florida on November 9, 1983. After testing and a hot test firing, the orbiter launched on its first mission on August 30, 1984. STS-41D was a six-day mission to deploy three satellites into Earth orbit. Just the 12th Space Shuttle mission, it took four launch attempts before Discovery finally got off the ground on its maiden flight. The crew also carried onboard an IMAX movie camera and parts of the mission were used in the IMAX file, “The Dream is Alive”. The storied career of Discovery would continue to be documented over its next 38 history making flights. The third shuttle to join the fleet after Columbia and Challenger, it would soon become the workhorse and star of the fleet performing many high profile missions, and setting many spaceflight firsts, including STS-63 where Astronaut Eileen Collins became the first female Shuttle Commander; STS-95 where the first American to orbit the Earth, John Glenn, became the oldest American to fly in space at the age of 77; the STS-60 mission saw the first Russian Cosmonaut carried into space aboard an American spacecraft; and STS-92 was the 100th flight of the shuttle program. The shuttle program itself came to a halt after Challenger was lost during ascent in January of 1986. The orbiter called upon for the return to flight mission was Discovery. The STS-26 mission launched from Pad 39-B at the Kennedy Space Center on September 29, 1988. The primary mission of STS-26 was the deployment of a NASA Tracking and Data Relay Satellite-3 (TDRS-3), though everyone understood the safe launch and landing of the shuttle, on its first flight since the accident, was the most important thing. The crew selected for the mission were all shuttle veterans, Commander Frederick H. “Rick” Hauck, Pilot Richard O. Covey, and Mission Specialists John M. “Mike” Lounge, George D. “Pinky” Nelson and David C. Hilmers. Despite a few minor issues onboard, the orbiter performed nearly flawlessly and opened the door for many more flights to come for the fleet. The Hubble Space Telescope would be the next high profile mission for Discovery. The telescope, which would go on amaze us with its images and discoveries for many years to come was the size of a school bus and weighed in at 24,490 lbs. It would ride in Discovery’s spacious payload bay into Earth orbit. STS-31 launched on April 24, 1990 from Pad 39-B at the Kennedy Space Center with another all veteran crew onboard. Commander Loren J. Shriver, Pilot Charles F. Bolden, Jr., Mission Specialists Steven A. Hawley, Bruce McCandless II and Kathryn D. Sullivan made up the crew. Due to the telescope needing to escape as much of the light generated from earth as possible, along with being well above the atmosphere to avoid any drag that would decrease it’s orbital altitude, the shuttle would launch to an orbital altitude of 379 miles, almost double the altitude of most shuttle flights before. To do this the orbiter would burn more maneuvering fuel just getting into orbit than on a normal flight. As always, the crew was prepared for anything that would come up on the mission. One of solar arrays on Hubble did not unfurl when commanded to do so. Both arrays were needed for the telescope to operate so while the payload team worked on a solution, McCandless and Sullivan got into their Extravehicular Activity (EVA) suits and were ready to go out and crank the solar array out manually. They were in the airlock waiting to go out when a new set of commands were sent to the array commanding both motors to fire simultaneously and the array finally deployed. Once again, the Discovery crew carried an IMAX movie camera on board and footage of the mission would become part of the IMAX film “Destiny In Space.” After 5 days, 1 hour, 16 minutes, and 6 seconds, Discovery landed at Edwards Air Force base completing a 2.1 million mile journey. Discovery would make two more trips up to the Hubble Telescope for the second and third servicing missions on STS-82 and STS-103 respectively. STS-63 was a Shuttle-Mir program flight, a program designed to allow U.S. and Russian personnel to work together in advance of their collaboration on the International Space Station. The mission would be to fly in close formation, but not actually dock with the Russian Space Station, Mir. Discovery launched from Pad 39-B at the Kennedy Space Center on February 3, 1995. Discovery’s crew included Commander James D. Wetherbee, Pilot Eileen M. Collins, Missions Specialists C. Michael Foale, Janice E. Voss, Bernard A. Harris, Jr. and Vladimar G. Titov. The crew alone provided Discovery with one more first for the shuttle program as Eileen Collins became the first female Shuttle Pilot. Discovery flew to just 37 feet away from the Russian Space Station during the first day on orbit. SPACEHAB-3 also flew in Discovery’s payload pay on this mission and the crew carried out numerous experiments while on orbit. After 8 days, 6 hours, 28 minutes, 15 seconds Discovery landed at the Kennedy Space Center completing its three million mile mission. Discovery once again launched Pad 39-B from the Kennedy Space Center on May 27, 1999 on the STS-96 mission. This would be the second shuttle flight to the International Space Station, but would be another first for Discovery as it became the first orbiter to actually dock with the station. Docking occurred on May 29 when Commander Kent V. Rominger, made a precise approach and docking maneuver. The rest of Discovery’s crew consisted of Pilot Rick D. Husband, Mission Specialists Ellen Ochoa, Tamara E. Jernigan, Daniel T. Barry, Julie Payette and Valery Ivanovich Tokarev. 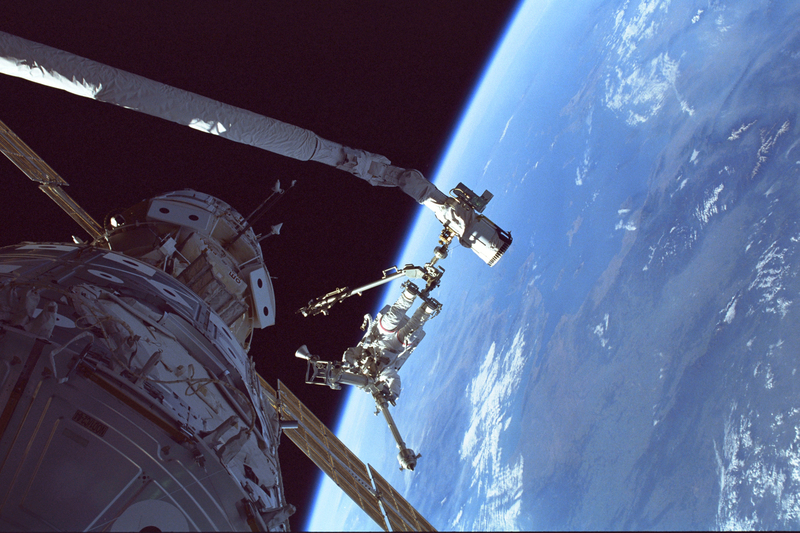 In just the fourth spacewalk in support of station construction and maintenance, Jernigan and Barry transferred a U.S.-built crane called the orbital transfer device, and parts of the Russian crane Strela from the shuttle’s payload bay and attached them to locations on the outside of the station. 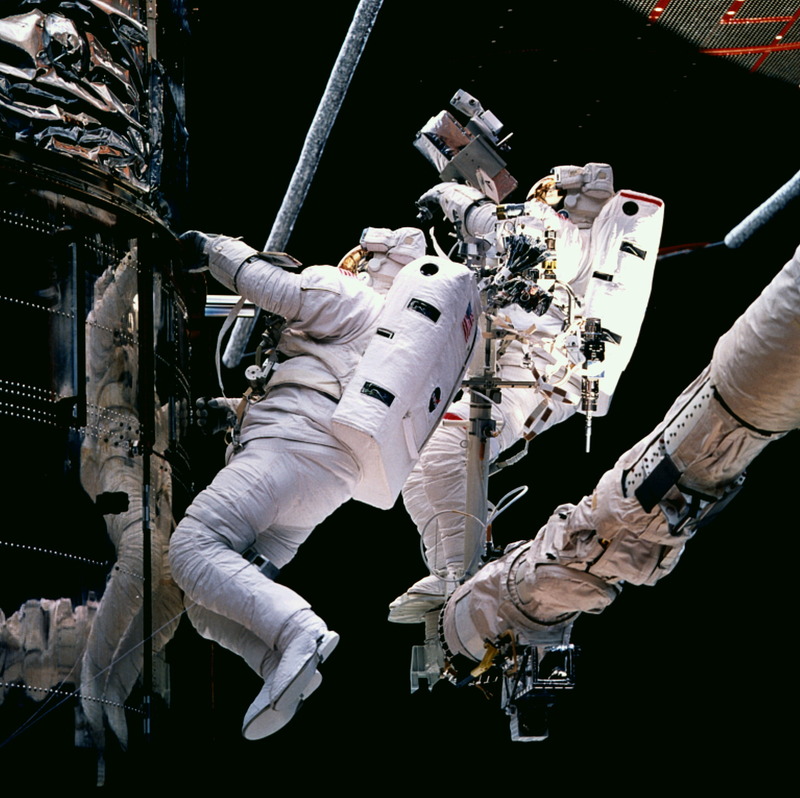 Their EVA lasted 7 hours and 55 minutes, the second longest spacewalk ever conducted. The crew also transferred 3.567 lbs of supplies to the station and performed other maintenance and procedures inside of the station. After almost 80 hours inside of the station, the crew closed the hatch and Discovery boosted the complex to an orbit of approximately 246 by 241 statute miles. Shuttle Pilot Husband then used Discovery’s thrusters to fly two and a half times around the station allowing the crew to photograph the outpost in orbit. 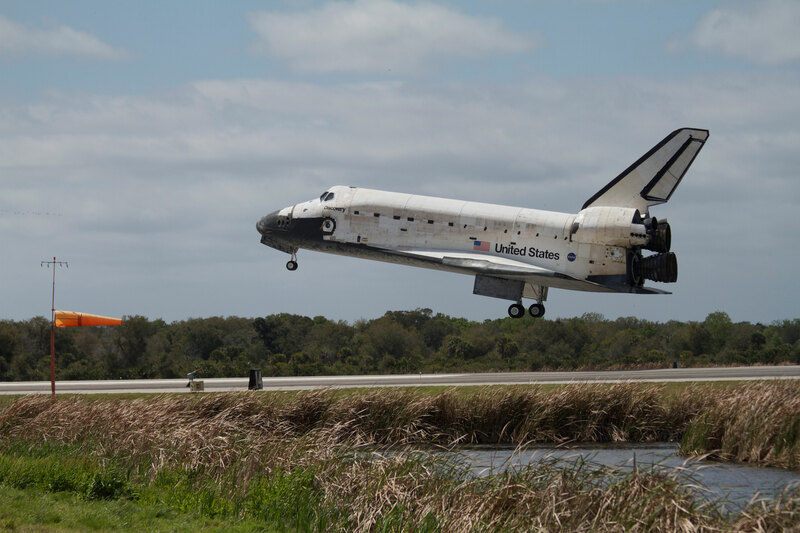 After a 3.8 million mile journey, Discovery landed at the Kennedy Space Center and would once again be prepared for another mission. The country suffered another loss when Space Shuttle Columbia broke up during reentry on the STS-107 mission on Feb 1, 2003. 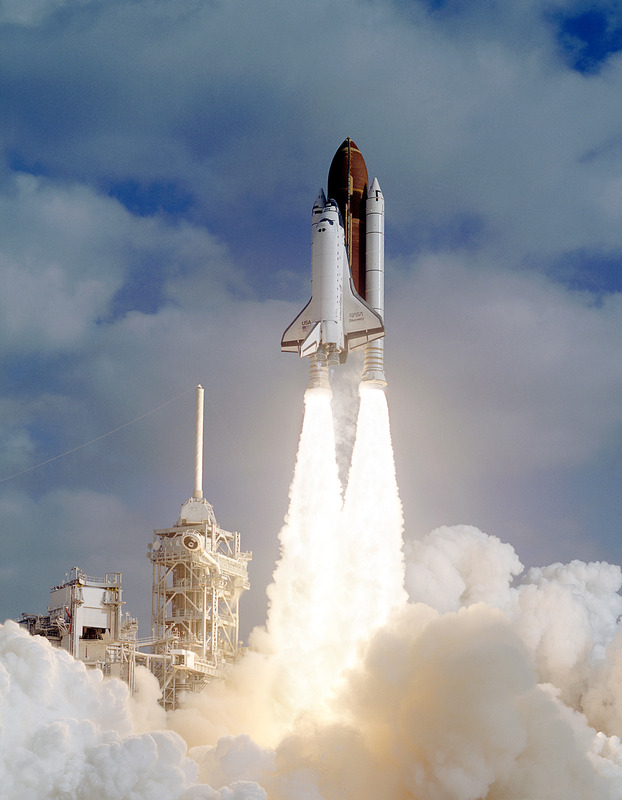 Once again shuttle launches were put on hold for more than two years. 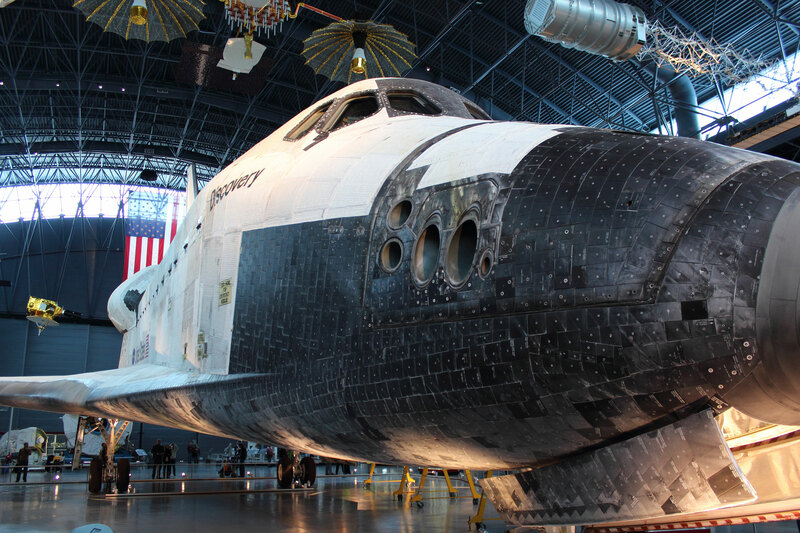 When flights returned on July 26, 2005, Discovery once again was up to the task. 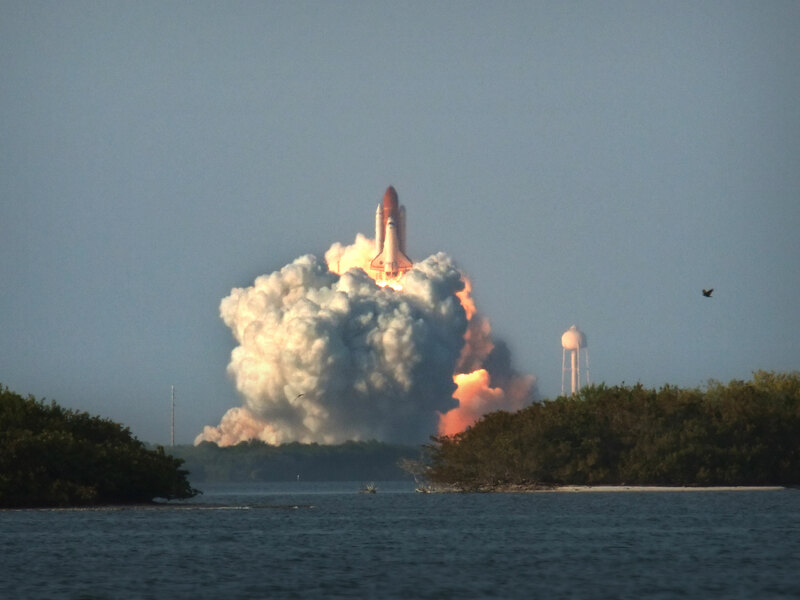 STS-114 began when Discovery launched from Pad 39-B at the Kennedy Space Center. Astronaut Eileen Collins, a three-time shuttle veteran, would command the mission, her second command. The rest of the crew was comprised of Shuttle veterans Pilot James Kelly, Mission Specialists Wendy Lawrence, Stephen Robinson and Andrew Thomas, and rookie Mission Specialists Charles Camarda and Soichi Noguchi. Discovery once again was there for yet another first for spaceflight as Commander Eileen Collins performed the first Rendezvous Pitch Maneuver about 600 feet below the station. The maneuver put Discovery in a slow end over end rotation at 3/4 degree per second. This allowed the Expedition 11 crew members to photograph the underside of Discovery and its heat-resistant tiles in detail. These photographs were transmitted to the ground for analysis while the shuttle was docked at the station. If there had been damage that could not be repaired, the shuttle crew would have remained on board the space station until they could be returned to earth by a later mission. STS-114 delivered much needed supplies inside the Raffaello Multi-Purpose Logistics Module along with the External Stowage Platform-2, a platform used to hold spare parts for the station. Three spacewalks were performed. Techniques for repairing the Thermal Protection System of the orbiter, while on orbit, were tested, and other tasks were performed. A very busy return to flight mission. Discovery and its crew landed safely at Edwards Air Force base on August 9, 2005 when weather prevented any landing opportunities at Kennedy Space Center. 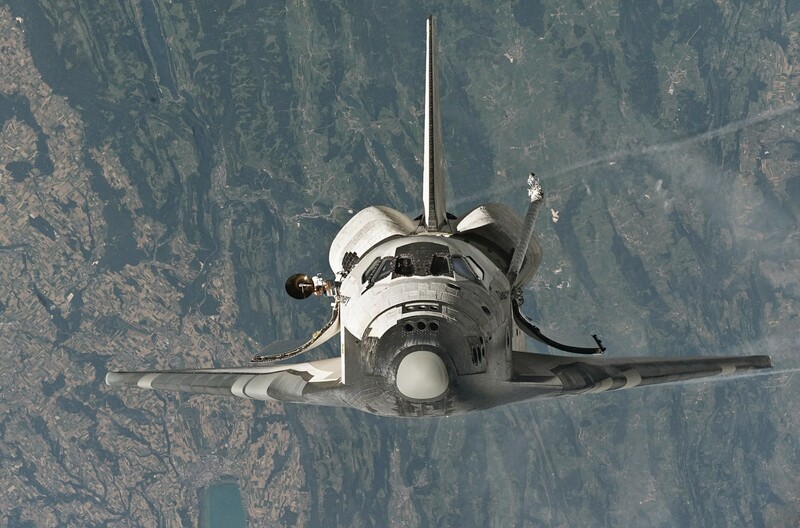 Discovery logged another 5.8 million miles during the STS-114 mission. On February 24, 2011, Discovery launched into a late afternoon sky on the final mission of its storied career. Discovery would be flying for the 39th time, the most of any of the orbiters. One final flight to the International Space Station lay ahead for the orbiter and crew. This would be the 35th flight by a shuttle to the orbiting outpost, adding another module and bringing supplies to the permanent outpost in low Earth orbit. The Leonardo module, originally designed as a transport module for bringing supplies and experiments to the station and returning waste and experiments to Earth would be permanently attached to the station on this mission, adding more storage space to the expansive space station. Leonardo had been to the station seven times before. After being refurbished to become a permanent addition to the station, it launched inside Discovery’s payload bay with 6,000 pounds of cargo including Robonaut 2, a robot that could be a precursor to future robots who could do day to day maintenance aboard the station and perhaps even due preliminary work for upcoming spacewalks by astronauts. With the shuttle program winding down, the massive supply runs that the orbiters could provide would no longer be an option, so Discovery carried an additional 2,000 pounds of cargo in its mid-deck to bolster the supplies aboard the station. The crew selected for this final flight were all spaceflight veterans. Commander Steve Lindsey would be taking his fifth trip to space aboard Discovery having served as Pilot on STS-87 and STS-95, and Commander on STS-104 and STS-121. Pilot Eric Boe was making his second trip to space having served previously on STS-126 as its pilot. Mission Specialist Michael Barratt had flown aboard the Soyuz TMA-14 mission and was a member of Expeditions 19 & 20 spending 199 days aboard the International Space Station. Mission Specialist Nicole Stott had flown to space once before on STS-128, a mission to the space station where she performed one spacewalk. She stayed aboard the station as part of Expeditions 20 & 21 returning to Earth on STS-129 after 91 days in orbit. Mission Specialist Alvin Drew was making his second trip to space having served as Mission Specialist of STS-118. Drew would perform 2 spacewalks during the STS-133 mission. Mission Specialist Stephen Bowen was making his third trip into space having served previously on STS-126 and STS-132. One last spaceflight first for Discovery occurred when he became the first astronaut to fly back to back shuttle missions. He was named to the mission just a few weeks prior to launch after Tim Kopra was injured in a bicycling accident. Stephen, a Spacewalking specialist, spent more than 47 hours outside the shuttle during Extravehicular Activities (EVA) on his 3 missions. Discovery and the crew completed its final mission in space, landing safely at the Kennedy Space Center 12 days, 19 hours, 4 minutes, and 50 seconds after it lifted off from Pad 39-A. 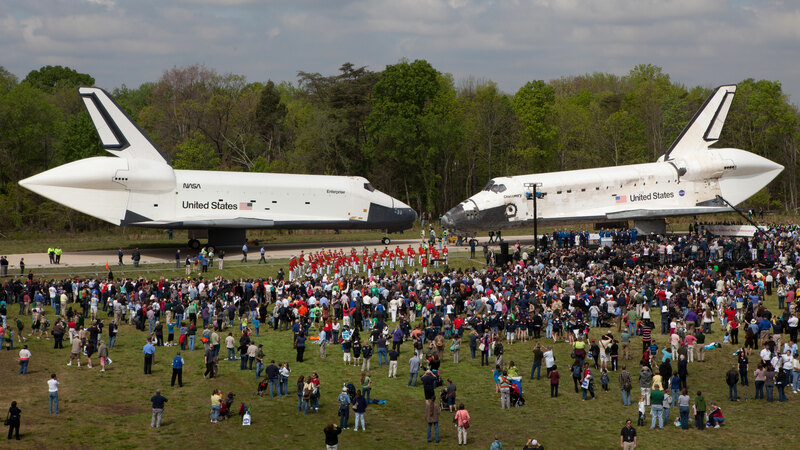 Today Discovery resides in its new home at the Smithsonian National Air and Space Museum’s Udvar-Hazy Center in Chantilly, Virginia, arriving there on top of the Shuttle Transport Aircraft on April 17, 2012. 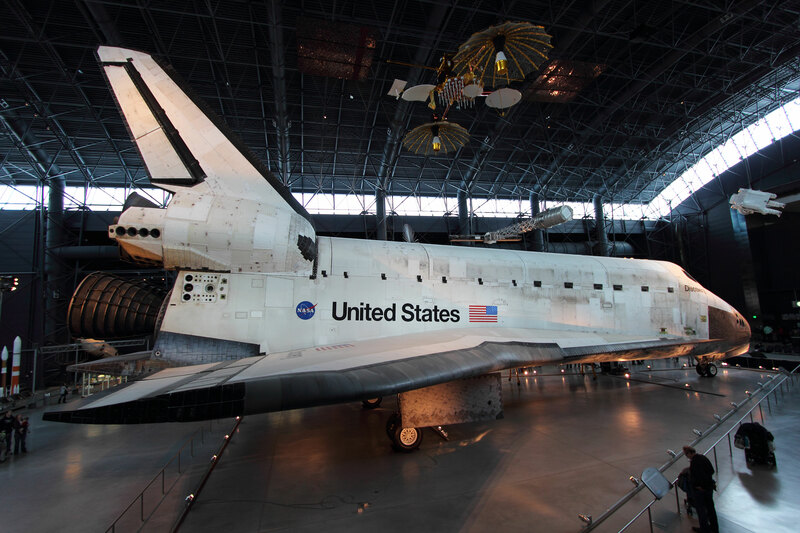 The aircraft that carried Discovery to Virginia, designated as NASA 905 was the same one that first delivered the spacecraft to Kennedy on Nov. 9, 1983. Inside the center you can get a close-up look at the orbiter, the wear and tear of 39 spaceflights on the orbiter, and learn more about its storied career. Also you will find many other spacecraft and aircraft in the enormous building.